Title: 06/24/1994 - MSDSs must be distributed to customer with shipment of chemical. This is in further response to your letter of April 25, requesting information about glutaraldehyde under Occupational Safety and Health Administration (OSHA) regulations. Specifically, your letter asked whether OSHA or other agencies have developed requirements for ensuring that persons exposed to glutaraldehyde are given adequate notice about its potential dangers, particularly where such dangers have been newly discovered. OSHA's Hazard Communication Standard (29 CFR 1910.1200) is designed to ensure that employees are adequately informed of hazards associated with exposure to hazardous chemicals used in the workplace. This standard requires chemical manufacturers and importers to evaluate the hazard potential of chemical products that they manufacture or import, and to disseminate hazard information to downstream distributors and users of those products. 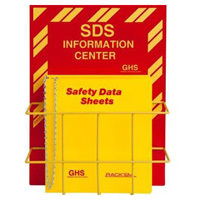 Hazard information must be transmitted on Material Safety Data Sheets (MSDSs) that must be distributed to the customer at the time of first shipment of the product. The Hazard Communication Standard also requires that MSDSs be updated by the chemical manufacturer or importer within three months of learning of "new or significant information" regarding the chemical's hazard potential. Therefore, chemical manufacturers and importers have a positive requirement to keep informed of developing hazard information relative to the products that they produce, and to transmit new information with the next shipment of a product made after the MSDS has been updated. The standard also contains specific criteria for defining hazards and for making the hazard determination. The Hazard Communication Standard requires all employers (including those in the health care industry) to develop a written hazard communication program that ensures that employees are formally trained in the hazards associated with exposure to chemical agents, and in the methods and procedures designed to protect them from those hazards. It is the employer's obligation under the standard to incorporate any new hazard information transmitted on MSDSs into the hazard communication program. Thus, the standard requires a "downstream flow of information," which means that producers of chemicals such as glutaraldehyde have the primary responsibility for generating and disseminating hazard information, while users of the chemicals must obtain the information and transmit it to their own employees. When complied with, OSHA believes that the Hazard Communication Standard ensures that employees will be appropriately informed of all chemical hazards present in their workplaces. We hope this information is helpful, and appreciate the opportunity to be of assistance. Mark the locations of your safety equipment and training materials with signs from Safety Emporium. I recently met with two practicing nurses who have expressed concern about a chemical which they are exposed to at work called Glutaraldehyde. It is my understanding that Glutaraldehyde is a commonly used sterilization chemical in Gastroenterology (GI) wards. The nurses with whom I spoke work in a GI ward at a hospital in my district. They have told me that, although they have been properly informed through labeling and information sheets as to its potential dangers, there are many people in the medical industry who have not been given adequate notice of newly discovered potential dangers. I would like to know if the Occupational Safety and Health Administration (OSHA) or any other agencies dealing with Glutaraldehyde have established a way to guarantee that those persons exposed to this chemical are given adequate notice about its potential dangers. Accordingly, I respectfully request that my concerns be addressed, consistent with applicable law, regulations, and/or agency policy. Please forward your response and any questions you may have to my Staff Assistant, Jennifer Saraceno, in my Bethlehem office. Thank you, in advance, for your attention to my concerns.